Ever since the dawn of modern DNA sequencing technologies, humankind has been on a mission to determine the genetic make-up of every single organism alive – first and foremost ourselves. After years of painstaking effort, the first human genome was sequenced in the 1990’s at the considerable cost of $2.7 billion. Now, almost two decades later, we can easily send our own DNA sample to a commercial company that will return a report with personal details of ancestry and disease susceptibility in a matter of days – for a mere $200. Not a single biological discipline has been immune to the rapidly growing influence of sequencing technology. It permeates virtually every aspect of the modern scientific approach. Genomic data accumulate at a rate that fast outpaces the capacity of human minds to make sense of them. But while sequence analysis finds most of its applications in human medicine, the innovation and ingenuity that led to the birth of genomics were firmly rooted in an altogether different branch of science: microbiology. 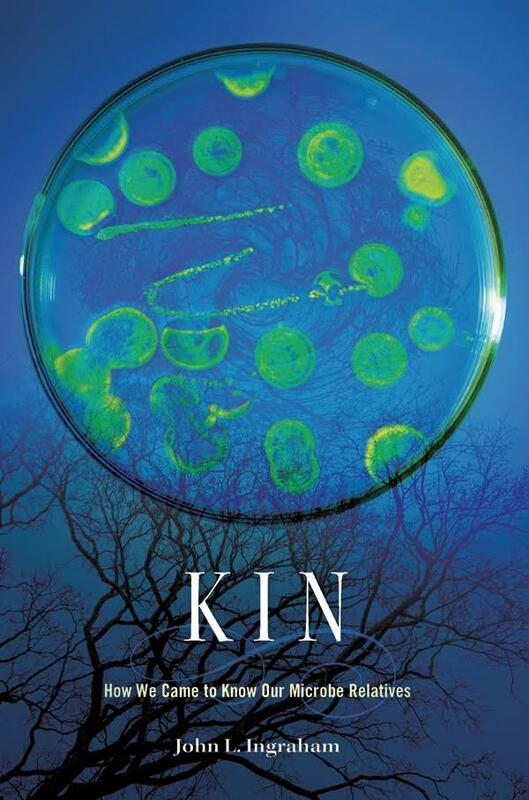 In Kin: How We Came to Know Our Microbe Relatives, John L. Ingraham steers us away from the anthropocentric view that makes many believe we humans are the most important or special beings on Earth. He redirects our gaze to the small and seemingly insignificant. In simple and straightforward prose, Ingraham restores the true importance of one of the most revolutionary yet understated discoveries of the last century: that we all descend from, and are intricately linked with, microbial creatures. Ingraham’s narrative is a profound story about our true origins, remarkable in scope and multi-dimensional in ambition. This all-encompassing tale extends from the beginning of life on earth to the present day, and occasionally casts a glance at the future. Readers who expect to learn about our unicellular friends (and enemies) will also find an account of the beginning of life, the discovery of DNA, the quest to cure disease, a brief digression into gene editing, and a forecast of impending ecological disasters. While this astonishing array of topics might easily boggle the reader’s mind, they serve a singular purpose: to illustrate the myriad connections that tie us to microbes. Ingraham lays out these dependencies in a way that not only reveals the grand history of life on this planet, but also the intellectual journey of the researchers that redefined our past. In multiple intersecting stories, he recounts the major discoveries of renowned scientists such as Louis Pasteur (who disproved the doctrine of spontaneous generation), James Watson and Francis Crick (who discovered the structure of DNA), Marshall Nirenberg (who cracked the genetic code) and Joshua Lederberg (who showed that bacteria can exchange genes). All of these individuals helped reconstruct what Darwin once imagined as the “Tree of Life:” a picture of the relationships uniting all living things on Earth. Among these relationships, writes Ingraham, “we live as a minority in the vast sea of microbes, even within our own bodies.” Microbes are much more abundant and diverse than all plants and animals combined. They form the trunk and main branches of the tree – macroscopic life constitutes a minor twig near the top. Not only do microbes vastly outnumber us, we are also dependent on them. Without them, life on Earth as we know it would not exist: there would be no oxygen in our air (cyanobacteria), no nitrogen in our soils (rhizobacteria), no beer or wine (yeast) or yogurt (lactobacillus), and in fact, no multicellular organisms at all, since microbes were our direct ancestors. Though he may sound a tad dramatic at times, John Ingraham is justified in making these sweeping claims. Professor Emeritus of Microbiology at the University of California at Davis, Ingraham is the author of multiple textbooks on microbiology and the popular book March of the Microbes: Sighting the Unseen. Despite his considerable expertise, Ingraham explains the complicated trajectory of discovering our microbial relatives in a tone that is both humble and curious. What are microbes made of? What do they look like? What do they do? And most importantly, what does this tell us about the history of life on Earth? The author confesses that sometimes, he doesn’t know the answer either. Evolutionary biology is a field with inherent ambiguity, because “as physiologist Jacques Loeb noted, we cannot experiment with the past.” This means there are inevitably things that we will never know. Ingraham addresses these philosophical issues as aptly as he explains the more material aspects of microbial science. Underlining the history of microbiology with scenes and quotations from the lives of eminent scientists, Ingraham gives the impression that he himself was witness to most of the events he describes. Indeed, at the respectable age of 92, he has personally worked with and met several of the distinguished characters in his book. This puts him in a position to convey the more personal side of scientific breakthroughs as well, an asset he uses liberally and with humor. Although the many anecdotes make for lively and relatable story-telling, the sheer fact there are so many might make it difficult for the reader to grasp the bigger picture. The entire history is organized by theme rather than chronologically, potentially causing some frustration for those looking for a linear timeline. The parallel scientific developments moreover force the author to repeatedly remind us that either “X” had not been discovered, or “Y” had not been invented yet, interrupting the flow and leading to unnecessary reiterations of the same point. This, in combination with some obvious errors in punctuation and word choice, introduces occasional distractions that could easily have been avoided. These small hiccups notwithstanding, Ingraham succeeds in painting a picture of the long journey towards discovering the “Tree of Life” and our place in it. While the technical details of molecular pathways and laboratory set-ups may sometimes be overwhelming for a non-expert reader, the author deftly alternates between method and discovery to impart the meaning of some of the most significant biological experiments of the last century. Modest and revealing, Kin focuses our eyes on the invisible and unfamiliar – and thereby puts our own existence into perspective. The book offers a pluralistic account of our varied encounters with the manifold microbes around us. But as divergent as it may seem, this story is equally unifying. Stringing together insights from many disciplines, distant places, and different times, Ingraham delivers a living history that is unique and whole, and invites us to become a part of it. Margret Veltman is an evolutionary biologist pursuing a Master’s degree in Environmental Sciences at Wageningen University in the Netherlands.